What a week! Heather and I traveled to Las Vegas last week, where we promptly went to Salt Lake City to visit friends for a few days before the New Media Expo. First, my Avis Car Rental rant. I paid an extra $10 a day to rent a Chevy Cobalt or equivalent from Avis rather than from other car rental places such as Budget or Enterprise because Avis offered a that size car with cruise control. I specifically wanted a compact car because of the price of gas. When it was time to pick up the car, they didn’t have a Cobalt or any sub compact car available. They had a very compact car that didn’t have cruise control or a full size car. After arguing with them, they finally found me a PT Cruiser. Reluctantly I accepted this and went on my way. As Heather and I got into the car to head to Utah, I noticed that the car didn’t have cruise control. Agg! I then turned around, went back in and at this point I was fuming! When I came back in and insisted on speaking to a manager, they just so happen to get a Cobalt avaialble for me to rent. Man was I not happy. So we got the rental car we wanted and we were on our way. When we were just north of Las Vegas, we started looking at the car closely. We discovered that not only did we get a sub compact car with cruise control, we also had an XM radio, OnStar, a CD mp3 player with an auxiliary input jack and heated seats. Aside from the lack of power in the engine, this car was nicer than my 2007 Honda Civic Si! Will I rent from Avis again? Maybe, I’m not sure. I talked to a few other people who have rented cars over the past few months and they all have had a similar situation with other rental places. It sounds like many people who rent cars are no longer opting for the free full size car upgrades, which is making it harder for the car rental places to keep the sub compact cars in stock. It’s a very pretty town. Lots of Wal-Marts! Very high gas prices too. It was great seeing our friends! 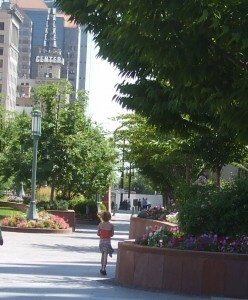 Thanks Kirk and Katie for a great time in SLC! On the way to SLC we spent the night at a Fairfield Inn hotel in st. George. I accidentally left my mp3 player in the room. I called them and they found it and kept it for me in their safe till I could stop by and pick it up. Great service, if I ever need a hotel in St. George again, I’m staying at that hotel. Thank you Heather, the Fairfield Inn employee who contacted me about the mp3 player. 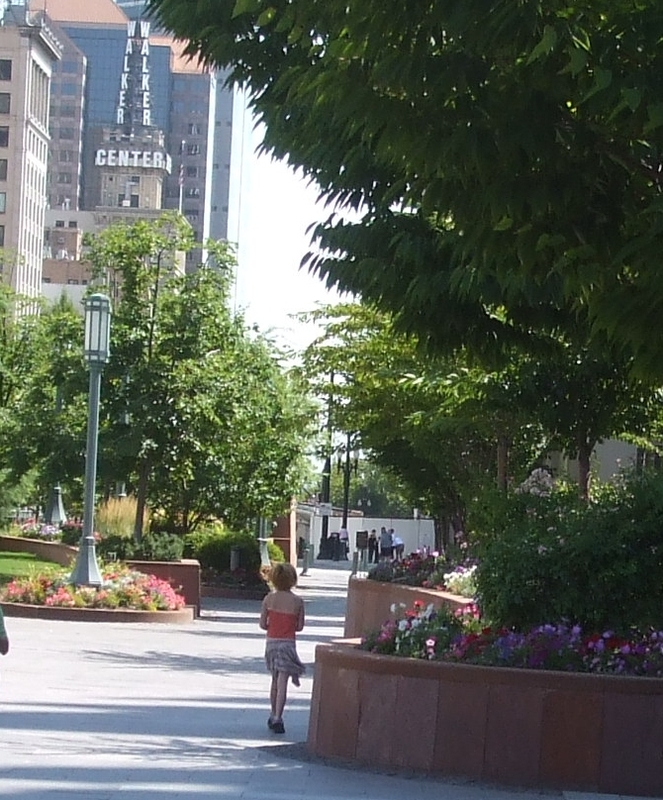 We got to see the downtown area and the Mormon grounds. I’m not sure what this area is called, I’m sure I’ll get comments about what it is called. It was very pretty but I was a bit upset to find out that I couldn’t go into some of the buildings because I was not Mormon. I may not be the best Catholic or Christian, but this seems to go against what I was taught. As we walked just outside of the grounds, we saw a homeless child walking down the street. I mean no offense to those who are Mormon, but there’s no way I could practice such a religion. Blame my Catholic background or Midwest mentality, but that’s not how we do things where I come from. The New Media Expo this year was awesome, from a vendors perspective having a booth that is. The first day was rather slow, reminded me of last year’s Sunday, which was a 1/2 day with very sparce attendee traffic. Friday was in full force though, and I was told Saturday had pretty good traffic as well. It was too bad Saturday was a 1/2 day, cause it sounded like it out performed Thursday’s attendee traffic. We shipped a lot of swag to the New Media expo. Over 250 pounds worth of show notepads (1,500 roughly), which we (RawVoice) are known for. This year we handed out about 250 pads, or 42 pounds. We had plenty of people come to the booth that weren’t interested in the swag. My theory is, since there was no sponsor for a New Media Expo swag bag during registration, attendees didn’t have a bag to put swag into and there for weren’t interested in carrying swag around in their hands. What a bummer too, since you can buy a box of 500 bags for less than $50. Anyway, this may not be the factor why not as much swag was handed out, but it makes sense to me. We (RawVoice and Blubrry.com) were a sponsor of the Coverville 500 concert at the New Media Expo this year. I am certainly proud to support these events which promote new media and podcasting. The show was awesome! From the numbers I’ve herd, they had about 600 attend the show. What’s exciting to say, we (Blubrry) gave away over 130 tickets to Blubrry.com, TechPodcasts.com and PodcasterNews.com community members. That’s over 20% of the guests who attended the show who have used one or more of the web sites I’ve helped develop over the years. I’m so proud to be part of this magic. All of the acts during the concert were awesome. The last artist was Richard Cheese and Lounge Against the Machine. Musicly, they sounded great. There was an issue though, which if you’re following all the buzz around Coverville or New Media Expo then you already know what went down during the last act. My take on the whole thing: Richard Cheese has been misleading the podcasting and new media community. The weeks before the expo, I went to Richard Cheese’s web site and saw that he was supportive of podcasters playing his content in their podcasts, so as long as no one profits from it. Sounds like someone who gets the whole podcasting and new media space to me, I couldn’t wait to see him live. Well during the first song performed by Richard Cheese and Lounge Against the Machine, Richard expressed to the podcasting and new media audience that he didn’t want them to use cameras. At first, I thought he was just being funny, part of the act. Anyone who gets podcasting and new media knows each artist who played at Coverville had an opportunity of a life time: have a bunch of tech savvy bloggers and podcasters do their thing to promote the artists on their blogs and podcasts. By the end of the first song, it was pretty obvious that Richard Cheese wasn’t interested in growing his audience or taking advantage of the marketing that would have come from all of the audio/video taken from the show but was more concerned with his self image. He grabbed a camera, threw it at the audience and then spit on others in the crowd. Well, bloggers and podcasters are vocal when they think they’re getting a raw deal, and Richard Cheese should expect a wrath of negative publicity, because face it, he took an opportunity to get a huge amount of positive publicity and flipped it negative within 1 song. One perspective: If we were news reporters, would Richard Cheese have taken the video camera and thrown it or spit on the camera man? Anyway, this whole incident reminds me of the SEOColumbus/DSW/Zappos Twitter incident. You can’t say or do stupid things in public or on publicly accessible web sites. If you do, you the world will find out about it. I think the New Media Expo could be considerably improved so it can grow additional traffic. Here’s some thoughts. Return the Peoples Choice Podcast Awards – I’m not sure what the real story is why the Peoples Choice Awards were not at the New Media Expo, but it should have been at the Expo this year. 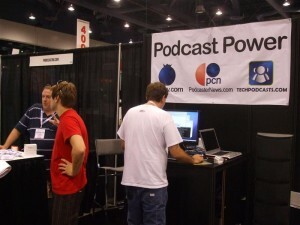 I think this one extra event during the expo would have helped encourage more podcasters to come out to the Expo. Todd and Tim, work it out and make it happen next year. Coverville 652 – Definitely need a Coverville concert for next years expo. Actually, if it wasn’t for Coverville, I suspect many podcasters would not have come out to the Expo. Change the Sessions – I think the whole idea of sessions at a conference needs to be seriously looked at. I’m not sure what the magic bullet is, but perhaps a PodCamp format would be more ideal. Technically they can’t have a “PodCamp” since the new media expo is a profitable event, but who is to say there’s a PodCamp at the New Media Expo that’s managed and funded separately from the rest of the expo? There’s a huge audience of podcasters who don’t bother with the New Media Expo becuase they’re part of the PodCamp franchise. I think if there is a way to make PodCamp part of the New Media Expo you will get these high profile folks to finally come out. This is key since they represent pretty much all of the New Media that’s going on along the East Coast. No more 1/2 day – I think the best formula is a 2 day event. After attending these first 4 Portable Media, Podcast and New Media Expo’s, I think the best formula would be a Friday and Saturday full day conference. It allows for those who have full time jobs to come in for a full day on Saturday while offering two weekend evenings for serious events like another Coverville. Ontario, California – As I suspected, having the event in Las Vegas made for a lot of distractions. I think the expo should return to Ontario, California simply because it puts the expo as the primary reason for being their, where Vegas created situations with too many options. The Wednesday and Thursday nights, it was hard to figure out who was at the casino hotel for the New Media Expo, and who was there for other reasons. Basically, New Media Expo hotel attendees were morphed by many more hotel guests who were their for other reasons that were more profitable for the hotel. It’s taken me almost a week to catch up following the Expo. I still have to send emails to the folks I met at the Expo, which I’ll be doing this weekend. Did I have a great time? Oh yea! Will I go again next year? You bet!